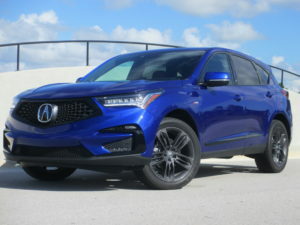 The 2019 Acura RDX is the first in a new generation of Acura models designed and engineered around Acura’s authentic and original Precision Crafted Performance brand values. 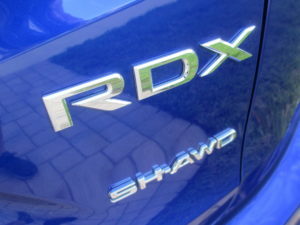 It’s the third generation of RDX, a perennial top seller in the premium compact SUV segment with cumulative U.S. sales exceeding 370,000 units since its debut in 2006.
and development conducted by the company’s North America engineering team headquartered in Raymond, Ohio, adjacent to the RDX’s manufacturing home in East Liberty, Ohio where RDX is produced using domestic and globally-sourced parts. 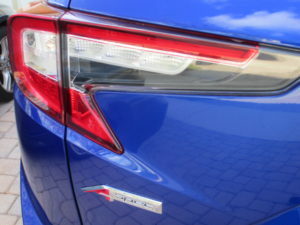 In setting their targets for the design and performance, the U.S. team drew inspiration from both the Acura Precision Concept and Acura Precision Cockpit as well as the pinnacle representation of Acura performance, the NSX supercar. The RDX is the first all-new design drawing from the Concept styling and the advanced Cockpit technology. The RDX team’s ultimate goal was straightforward: to make the best RDX ever, a vehicle that sets the foundation for an entire new generation of Acura vehicles in terms of styling, performance, premium quality and technology. The RDX redesign features a new-from-the-ground-up, Acura-exclusive platform, a powerful, responsive and efficient new powertrain, and a more spacious, premium and tech-savvy cabin. 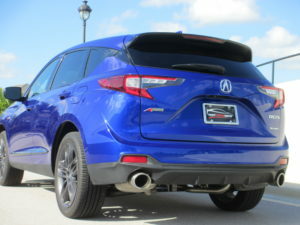 With its new turbocharged engine, segment-first 10-speed transmission and the newest generation of available Acura Super Handling All-Wheel Drive™ (SH-AWD®), the new RDX is also the quickest, best-handling RDX ever; and with its new longer and wider platform, the 2019 RDX also boasts top-class cabin and cargo space with exceptional comfort, utility and versatility. an intuitive, easy-to-learn user interface designed from a clean slate around the driver and the driving experience. 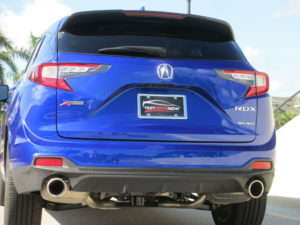 The 2019 RDX is available with Technology and Advance packages. In addition, the new RDX will be the first Acura SUV with an A-Spec variant, boasting distinctive sport appearance detailing inside and out. Through its extensive redesign, the 2019 RDX focuses on performance more than ever before. Power comes from a new direct-injected and turbocharged 2.0-liter 16-valve DOHC inline-4-cylinder engine with VTEC® valvetrain. With peak output of 272 horsepower and 280 lb.-ft. of torque (both SAE net), the RDX has the highest power output among key competitors1. Peak torque is up 28 lb.-ft. and available from 1,600 to 4,500 rpm, with a 40 percent increase in low-end torque versus the outgoing 3.5-liter normally aspirated V6. The 2.0-liter engine’s low-inertia turbo, electronic wastegate and VTEC® valvetrain work in concert with the new Sequential SportShift 10-speed transmission, featuring a 68 percent wider ratio range and available 4-gear direct downshifts, to deliver smooth, linear and virtually lag-free power while still receiving superior EPA fuel economy ratings, improved by as much as 11 percent versus the previous model. The new 2.0-liter VTEC Turbo also contributes to the RDX’s more compact front packaging, shortened front overhang and improved front/rear weight distribution (57.4/42.6 vs. 60/40 for previous RDX with all-wheel-drive). The 2019 RDX is available with two drive configurations: front-wheel drive (FWD), and the latest generation of Acura Super Handling All-Wheel Drive™ (SH-AWD®). 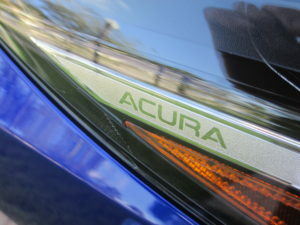 This new SH-AWD system is the most advanced mechanical iteration in Acura history. With SH-AWD, up to 70 percent of engine torque can be distributed to the rear wheels in normal driving scenarios, and 100 percent of that torque can be distributed to either rear wheel. The use of dynamic torque vectoring enables outstanding all-weather confidence, handling precision and cornering grip by making optimal use of tire traction and by inducing a yaw moment to help rotate the vehicle in a turn. The RDX’s body structure is an all-new, bespoke design that is lighter, more rigid and more tightly sealed than before, and features multiple new material and design attributes, including a world’s first two-piece (inner and outer) ultra-high-strength-steel front door ring design, a new double-ring rear frame structure, and Acura’s first use of high-performance structural adhesives. The new unit body, utilizing high-strength steel for over 50 percent of its construction, is roughly 20 pounds lighter than before, substantially more rigid throughout, and should assist the RDX to receive its targeted top-class collision safety ratings. New measures taken to improve cabin quietness include an Acura SUV-first application of sound-absorbing acoustic spray foam in 12 body cavities, a 15 percent increase (by surface area) in sound-deadening material, the use of triple door seals and upgraded glass (thicker or acoustic laminated) all around. The RDX’s new body is mated to a thoroughly reengineered chassis with a longer wheelbase (+2.6 in. ), wider track (+1.1 in. front and 1.3 in. rear) and upsized standard wheels and tires (+1 inch). Its new suspension consists of a sport-tuned Macpherson strut front setup and an all-new 5-link rear design, with the front equipped with hydraulic compliance bushings and mounted to rigid subframes (rubber isolated in the rear) to provide higher levels of handling precision and ride refinement. 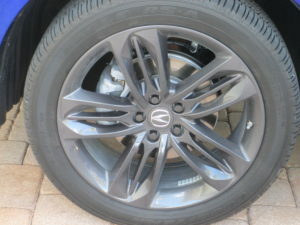 The standard RDX, Technology and Advance grades each get unique 19-inch alloy wheel designs, whereas the RDX A-Spec features 20-inch wheels and wider, lower-profile tires. Precise and communicative steering is supplied by a new Dual-Pinion Variable-Ratio Electric Power Steering system, while confident stopping performance comes from 4-wheel disc brakes with Electronic Brake Force Distribution. The RDX also features a larger fuel tank (+1.1 gallons). All RDX models also come standard with Acura’s Integrated Dynamics System, with four distinct drive modes: Comfort, Sport, Sport+ and Snow modes, controlled from the center console-mounted drive mode dial like NSX. 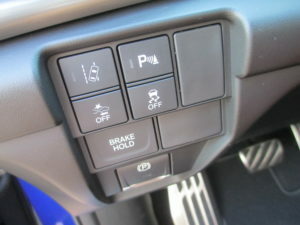 The system interacts with the Drive-by-Wire™ throttle, 10-speed transmission, electric power steering, SH-AWD (if equipped) with torque vectoring, traction control, Active Damper System (on Advance grades) and Active Sound Control to provide a wider range of driving experiences and dynamic capabilities based on the needs of the driver and driving conditions. Taking inspiration from the Acura Precision Concept, the RDX is the first all-new Acura model designed from the ground up around the brand’s more emotional and evocative design language. 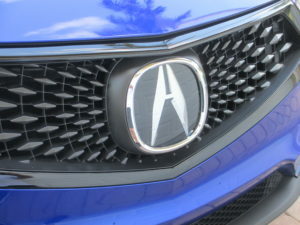 The bold and bright front fascia is highlighted by Acura’s signature diamond pentagon grille, next-generation Acura Jewel Eye™ LED headlights and functional, wing-shaped lower air curtain opening, inspired by the NSX. Sharp and dynamic body lines along with LED exterior lighting compliment the RDX’s more athletic proportions and stance, resulting in design that is at once more elegant and muscular than ever before. A-Spec badging on the front quarter panels and tailgate complete the exterior package. 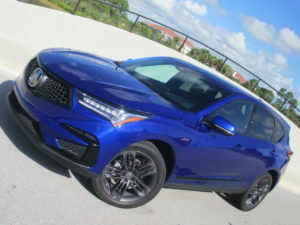 The 2019 Acura RDX, available in standard, Technology, A-Spec and Advance grades, is offered in nine exterior colors, five pearlescent and four metallic, including four new premium colors – Majestic Black Pearl, Apex Blue Pearl (A-Spec exclusive), Performance Red Pearl and Canyon Bronze Metallic. 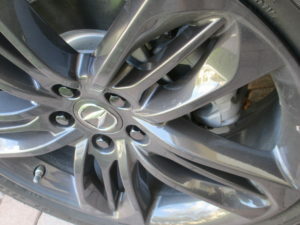 The new premium paint options use a special process with two unique base coats and a special clear coat for a deeper, more lustrous appearance. 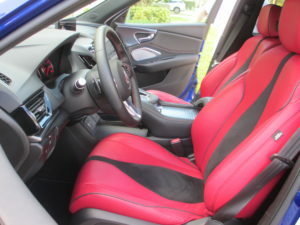 The RDX’s all-new interior is more spacious, luxurious and tech savvy, providing customers with a higher level of comfort, connectivity and convenience than ever before. High-grade, authentic and premium material treatments abound, including hand-wrapped, stitched leather surfaces on the soft-touch instrument panel, doors and center console, set off by brushed aluminum or available open-pore Olive Ash wood accents. 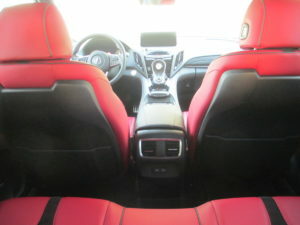 The RDX’s driver and front passenger are also treated to a higher level of customizable comfort by next-generation Acura sport seats, with a more rigid and light weight ultra-high-strength steel frame, more intricate sculpting details, softer and more durable perforated Milano leather trim (Technology and above), and up-to-16-way power adjustability for both the driver and passenger. Furthermore, all RDX occupants will enjoy the open and airy feeling of the new ultra-wide panoramic moonroof, among the largest in a compact-luxury SUV and offered standard on every new RDX. 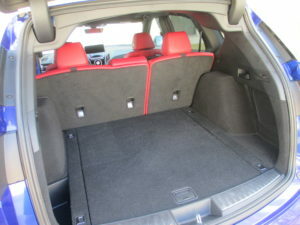 The new wider and longer platform also contributes to significant gains in interior space and comfort, where the new RDX boasts top-class interior volume (103.5 cu.-ft.) and cargo space (76.9 cu.-ft.) along with class-leading second-row knee space—a 15-percent increase from the current model and 24-percent more than its nearest segment competitor. Its virtually flat rear floor further enhances passenger comfort in the second row, while a new 1.7 cubic-feet of compartmented underfloor storage in the rear cargo area provides handy and discrete storage space for valuable or infrequently used items. 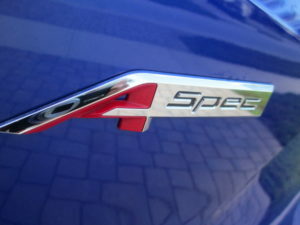 A-Spec grades also get significant interior design changes to match its sport-oriented exterior upgrades. 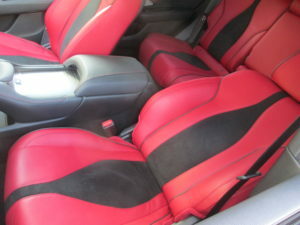 These include Madder Red or Ebony Milano leather sports seats with black Ultrasuede® inserts and red or gray contrasting stitching, a black Ultrasuede® dash insert and black headliner and pillar treatment. 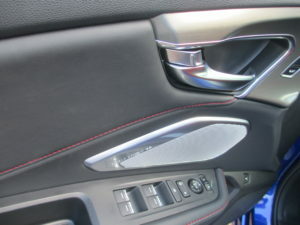 A-Spec also adds stitched and perforated leather-wrapped sport steering wheel with larger paddle shifters, metal pedals, brushed metal look meters with red accents, red interior illumination, dark finish tint to the brushed aluminum interior accents and A-Spec badging on the steering wheel and front door sills. 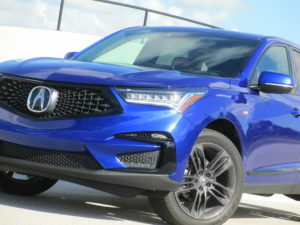 The 2019 RDX hosts a suite of advanced new technologies, including the Acura True Touchpad Interface™, featuring an all-new Android-based operating system, a high-mounted 10.2-inch full-HD display and an innovative touchpad with the first-ever application of absolute-positioning in a driving environment. Absolute positioning departs traditional touchpad interfaces, using one-to-one mapping to deliver a more intuitive and driver-oriented user experience. The new True Touchpad Interface™ is standard and all grades of RDX will include Apple CarPlay™ compatibility, plus Wi-Fi-enabled over-the-air system updates. Android Auto™ compatibility will be introduced later, pending release and certification of touchpad specification by Google. The 2019 RDX also debuts the available Acura/ELS Studio 3D™ premium audio system, tuned by Grammy-winning music producer Elliot Scheiner. The 710-watt system utilizes 16 discrete sound channels and 16 speakers, including four ceiling-mounted Highline™ speakers to create a more natural and omnidirectional high-fidelity listening experience – the most advanced audio system ever offered by Acura. 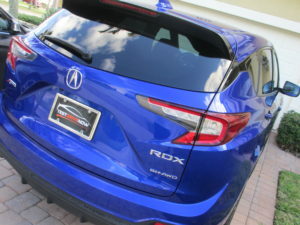 The new RDX also features the latest generation of AcuraLink® cloud-based services, with Basic, Security, Remote and Concierge service packages, featuring 4G LTE in-car Wi-Fi, smartphone-enabled remote unlocking and engine start, concierge services, remote diagnostics, virtual dashboard stolen-car tracking and more. 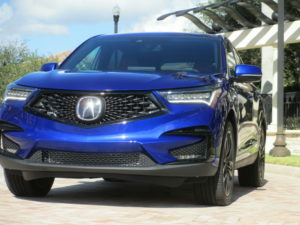 The RDX with Technology and above grades feature the latest iteration of Acura’s embedded, satellite-linked navigation system, developed in partnership with HERE, with new features including 3D terrain mapping, auto-zoom and on-line points-of-interest searches via in-car 4G LTE Wi-Fi. RDX models with Advance Package get a full-color interactive 10.5-inch Head-Up Display with a wide array of customizable information displayed within easy view of the driver. The third-generation 2019 RDX offers the highest level of standard safety and driver-assistance features in the model’s history – and in its class. The AcuraWatch™ suite of technologies is now standard on all RDX grades, along with a Multi-Angle Rearview Camera, while the Technology Package and higher grades add blind spot information (BSI), front and rear parking sensors and Rear Cross Traffic Monitor. 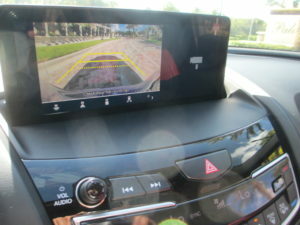 The RDX with Advance Package includes a Head-Up Display and Surround View Camera System for the first time. 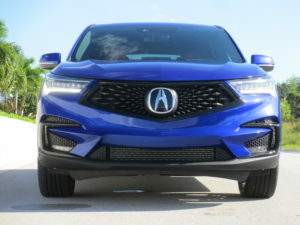 With its advanced body design, including the latest generation of Acura’s Advanced Compatibility Engineering (ACE™) body structure, a laser-welded and hot-stamped ultra-high-strength steel door ring design and advanced supplemental restraint systems, including new driver and front-passenger knee airbags, the 2019 RDX provides a high level of collision protection and targets the highest available collision safety ratings: a 5-Star Overall Vehicle Score from the NHTSA and a TOP SAFETY PICK+ rating from the IIHS, including a SUPERIOR rating for frontal collision prevention. All design and testing for the new RDX’s safety technology and collision safety performance was conducted at the company’s Advanced Safety Research facilities in Raymond, Ohio, which have played a leading role in the development of new collision safety structures for Acura globally. 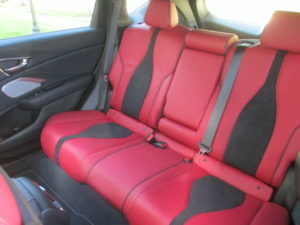 As shown with all options included and fees: Total Vehicle Price $46,495.